The C4 is Michelin's Standard Weight MTB tube for 26 Inch tires from 1.6 to 2.1 inches wide (559-40/54). 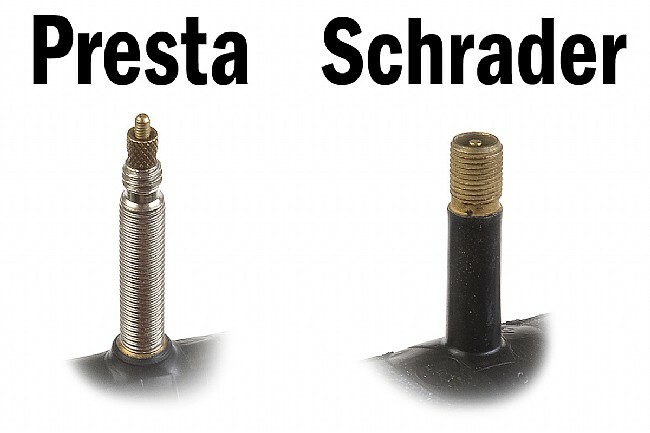 Available with a 34mm Schrader or 34mm smooth Presta valve. 170g (average weight). I purchased the Michelin C4 Airstop tubes to accompany new Kenda K847 Kross Plus tires. The standard weight tube provides solid no leak performance. They were easy to install and hold up well under harsh riding conditions. This tube does not fit my 559 rims properly. Way to wide and poor quality. You get what you pay for. I paid more for 2 proper sized and fittting tubes from another cycling shop and gave these away to a neighbor that used them for his beach cruiser. Fit perfect for his 26x 2.125 tires and rims. Nothing fancy, and more reliable than imports from Asia. Good price, too. 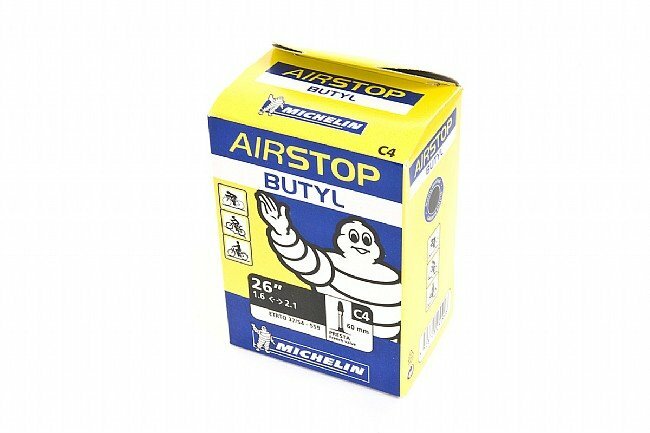 Michelin Airstop-The greatest, thanks so much fast shipping. I use it on a Fuji and I like every thing about it as it keeps air in my Michelins without having to adjust it every time you want to ride. Just get on and go. Had these for a couple of months now, replaced my old tubes with these when I got some new tires. Easy to fit, love the Presta valves. Got 3 so I can keep a spare on the bike. It is a little big on 1.5 in tires, which was expected. No flats, no complaints. Does the job, good value. Good value, installed and riding. I've always found Michelin tubes to be great quality (made in France) and they were less money at Bikes Tires Direct than cheap made in Taiwan tubes at REI. Paired these up with the Kenda K847 Kross Plus. 26x1.95. Works great !! Work great so far, I am going on two months of street/trail riding! It's an innertube. If it hols air pressuer, and it does, what more can you expect. This tube was manufactured to fit the Michelin Country Rock tires that I bought. After assuring that the first purchase of the tubes and tires were matched, I purchased extra spares. It is hard to go wrong with a name like Michelin. The tube is great tire never goes flat pump mostly once or twice a months with everyday riding on a mount ain bike with 26 2 12 tires so it does a great job. hello. i purchased two of these tubes about a month ago . they are worth the money. even though they are square tubes, they are good. a helpful hint is to fill them up with air, about 4 or 5 pumps with an air pump helps get them seated properly. i have been usi ng them with no problems!